Q) What was the main reason for accepting this role ? Firstly, I felt proud to be a part of this epic drama which was made with high standards. I am happy that I could contribute my bit to this magnum opus. Secondly, I want the old tradition of multi-starrers to take center stage in Tollywood. This will help filmmakers to churn out many historical dramas in the coming days. Q) Rudhramdevi is shot in 2D and 3D formats. Which one is harder to act in ? Acting in 3D format is very hard. It involves a lot of time and is a complex procedure. There are two procedures involved in 3D format. One is to shoot the entire film in 2D and then convert it into 3D. The other format is shooting with a stereo-scopic technology, which we used for Rudhramadevi. We have to maintain the mood and expression throughout the time delay which is very hard for any artist. Q) What support did you lend for this epic drama ? I offered my complete support to the film. Guna Sekhar offered this role while I was working for S/O Satya Murthy. 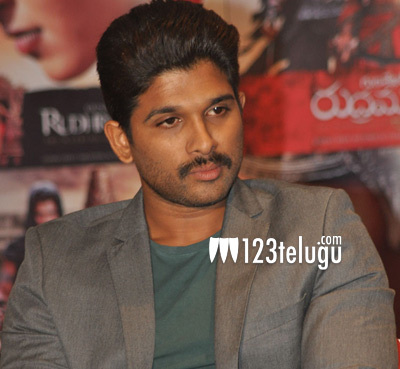 I gave the nod to the project although I was shooting for S/o Satyamurthy. I adjusted my dates and gave my best for this role. Q) What is the best compliment you got for your role ? More than compliments, I earned a lot of respect for Gona Ganna Reddy’s character. A lot of directors in Tollywood praised me after I accepted the role. Q) Is it not a risk to spend a whopping budget on a female centric film ? A) No. Content is the king for any type of film. Arundhati is the best example to prove that a film with strong content can do wonders at the box office. Q) Tell us about Anushka’s hard work for this film ? I should salute Anushka for her hard work and dedication. She worked for almost three years on this project. No one else could have done such a tremendous job.